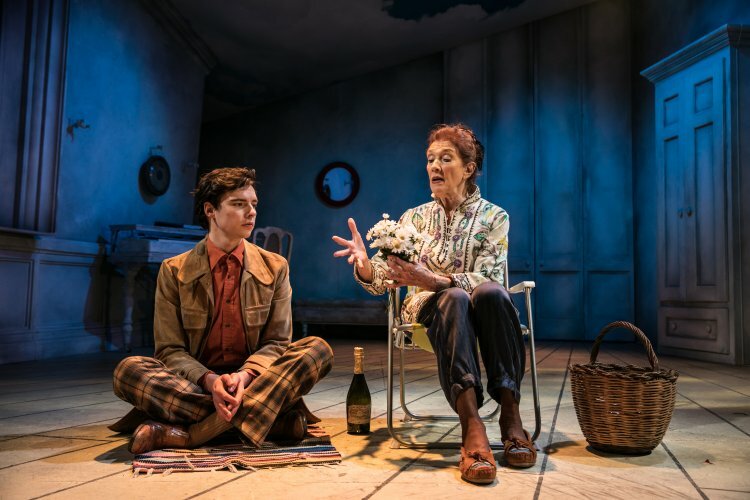 Adapted by Colin Higgins from his black comedy film, ‘Harold & Maude’ tells the story of the unlikely friendship between Harold, a 20yr old man obsessed with death and the macabre, and Maude, a nearly 80yr old kleptomaniac spinster with an unparalleled zest for life. 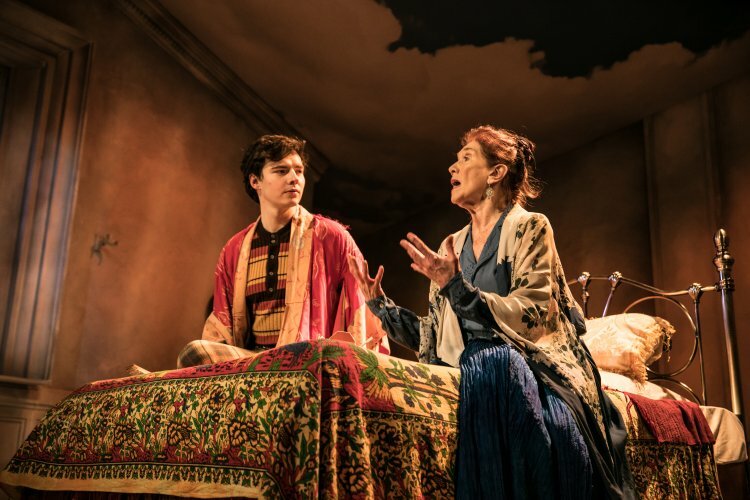 In the hands of Charing Cross Theatre’s artistic director Thom Southerland, the revival is in a word; absurd, but in a lot of good ways. Southerland has masterfully assembled an ensemble of exceptional actor-musicians who expertly underscore the entire play for exquisite dramatic, and comedic affect. Andrew Johnson’s sound design is flawless in ensuring Michael Bruce’s impressive score fills the Charing Cross Theatre in an effortlessly balanced way. Accompanied by pitch perfect vocals they transport you through each scene seamlessly helping to perfectly reflect the emotional journey of Harold & Maude’s relationship, providing a sense of otherworldly storytelling. As Harold Patrick Walshe really steals the show. His portrayal of this fake suicide attempting recluse is perfectly weighted. He effortlessly conveys the shy awkward boy obsessed with death and attending stranger’s funerals and charters his transformation into a man who yearns to explore more of life with heartbreaking nuance. 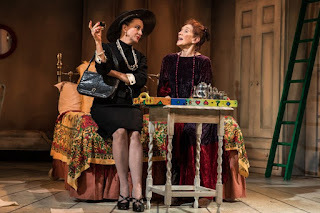 Linda Marlowe embodies the eccentric Maude with an innate ease that’s simply heartwarming; you can’t help but support the journey she takes Harold on and the life experiences she regales that help to drop his guard and start asking the questions he never dreamed of asking. 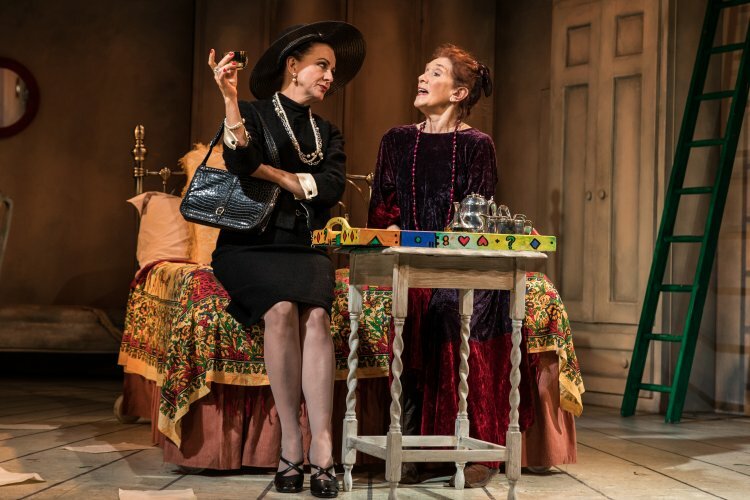 Rebecca Caine is a standout with her hilarious portrayal of Harold’s mother. She gives a masterclass in the art of facial comedy, stealing almost every scene she’s in. Joanna Hickman gives wonderfully dynamic turns as all the dates Harold’s mother sets up for him in order to advance socially, and Samuel Townsend’s seal impression is worth the price of admission alone. our own outlooks on life and reminds us that we’re hanging in the balance. 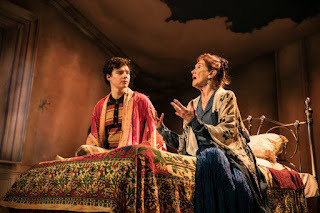 This is cleverly supported by Francis O’Connor’s sky themed set, it’s light minimal palate coupled with Matt Clutterham’s haunting lighting design gives the idea that the whole of the company are suspended in some sort of purgatory; Harold so young but living to die, and Maude, aged but dying to live. Ultimately, however, it becomes apparent that the thing they’re both trying to escape is precisely what they’re hurtling towards and in the end, is their undoing.